Alcoholism is unfortunately common in the United States, with around 16 million Americans documented with alcohol use disorder in 2015. Recovery from alcoholism is not so common; despite millions of Americans suffering from alcohol use disorder, less than 10% of them receive alcohol addiction treatment. If you are seeking treatment for an alcohol addiction, you are among the fortunate few that will be able to recover with comprehensive addiction treatment. Alcohol use disorder is a mental health disorder that represents compulsive alcohol abuse, despite varying consequences that occur from drinking alcohol. The National Institute on Alcohol Abuse and Alcoholism define alcohol use disorder as “problem drinking that becomes severe” (NIAAA). More than once, wanted to cut down or stop drinking, or tried to, but were couldn’t? Experienced craving— a strong need, or urge, to drink? Found that drinking— or being sick from drinking— often interfered with taking care of your home or family? Or cause job troubles? Or school problems? Found that when the effects of alcohol were wearing off, you had withdrawal symptoms, such as trouble sleeping, shakiness, irritability, anxiety, depression, restlessness, nausea, or sweating? Or sensing thing that were not there? If you have any of these symptoms, your drinking may already be a cause for concern. The more symptoms you can identify as having, the more urgent you need alcohol addiction treatment. Two or more of the above symptoms, within a one year period, means that you have an alcohol use disorder (NIAAA). Alcohol produces both short term and long term effects. The effects from alcohol can be physical, mental, and health-related. If you consume alcohol in an excessive amount, you could also get alcohol poisoning, which is lethal. 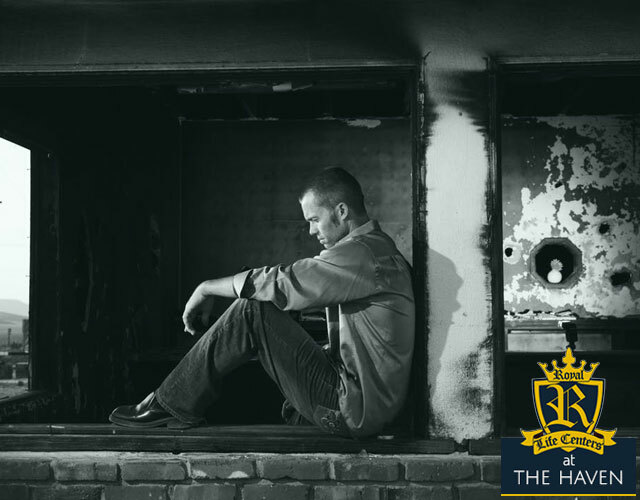 Royal Life Centers at The Haven is the first step in recovery, as we provide effective alcohol detoxification services. Our medical detox center is an inpatient program, that lasts for either 4 or a full 8 days. Upon arrival to our medical detox center, Royal Life Centers at The Haven, guests will be assessed for their symptoms of withdrawal and evaluated for any co-occuring disorders. Detoxing from alcohol will produce a variety of withdrawal symptoms, which is why an alcohol detox is best done in a safe, controlled environment with 24/7 direct supervision from medical professionals. Royal Life Centers at The Haven offers guests safety during an effective and comfortable detoxification from alcohol. Alcohol withdrawal symptoms can be extremely severe and even life-threatening. Withdrawal symptoms range from headaches to delirium tremens. Someone with an alcohol addiction will start to experience withdrawal symptoms roughly 8 hours after their last drink. Withdrawal symptoms can last for a varying amount of time, depending on different factors including: drinking history, frequency, health condition, and volume of consumption. Alcohol withdrawal can be represented by three stages of symptoms. In our alcohol treatment center, we guide recovery through proven effective methods of addiction treatment. Royal Life Centers at The Haven treats alcohol addiction through intensive therapy, including individual therapy sessions, group therapy, and support groups. According to the Substance Abuse and Mental Health Services Administration, there are four major principles that constitute recovery, including: health, home, purpose and community. Health- overcoming or managing one’s disorders and making informed, healthy decisions that support physical and emotional well-being. Home- having a safe and stable living environment. Purpose- conducting meaningful daily activities and having the independence and resources to participate in society. Community- Having relationships and social networks that provide support, friendship, love, and hope (SAMHSA). Treating alcoholism is best done with a comprehensive addiction treatment program, which provides support and a range of helpful services. Our treatment facilities all provide comprehensive addiction treatment. We provide both inpatient and outpatient treatment options. Royal Life Centers at The Haven offers a medical detox program to begin the recovery process. Royal Life Centers also offers treatment programs, including: a residential inpatient program, a partial hospitalization program (PHP), an intensive outpatient program (IOP), an outpatient program (OP), sober living and graduate housing. For an alcohol treatment center near you, please click here for a list of our locations. “Alcohol Use Disorder.” National Institute on Alcohol Abuse and Alcoholism, U.S. Department of Health and Human Services, www.niaaa.nih.gov/alcohol-health/overview-alcohol-consumption/alcohol-use-disorders. “Recovery and Recovery Support.” SAMHSA, Substance Abuse and Mental Health Services Administration, 30 Jan. 2019, www.samhsa.gov/find-help/recovery. “The Effects of Alcohol Use: Short & Long-Term Physical & Psychological.” Alcohol.org, American Addiction Centers, www.alcohol.org/effects/. If you or someone you know is struggling with an alcohol addiction, please reach out to our team of addiction specialists at (877)-RECOVERY or (877)-732-6837. Our team is available to take your call 24 hours a day, 7 days a week. Because We Care.